Mange is NOT passed from animals to humans and neither are human head or public lice. Each animal has its own species of lice that likes to just stay on that particular species. For example, chicken lice love the fact that a chicken’s body temperature is about 105 degrees. So, if they would get onto a human, it would be too cold for them. However, they may jump onto the body of another species for a short visit and this can cause problems before they jump off again. Mange—Demodectic is caused from a burrowing skin mite called sarcoptic mange mites (that don’t like the temperature of a human body for long). This is what we are looking for when we do a skin scraping on your pet. Mange—Sarcoptic can be in many species. Here are pictures of the Sarcoptic scabei mange mite and what it can do to a human. Animal mange looks similar, but often flea allergies will be the real cause of skin that looks like this. 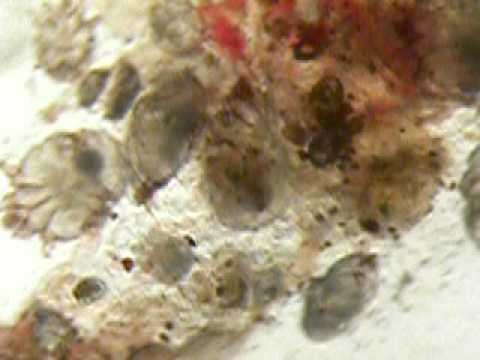 Above picture is a dog with generalized sarcoptic mange.Below is a microscopic slide with a mange mite to the left of center. Typical look of scabies in a dog. Treatment for mange: There are all kinds of treatments for mange that involve harsh chemicals and pesticides, but supporting and strengthening the immune system with herbs, supplements and a good diet seems to be the most effective method in resolving these kind of infections.